Derek, Saphire and I have just returned from a very relaxing vacation in Fiji, our last as a family of three! The new baby is scheduled to arrive in a couple of weeks so we’re hunkering down, making ready for our new arrival. We are still in Australia, but continue to work towards the new season. Derek is tracking the progress made by our new safari vehicles being shipped from the UK to Lusaka on a daily basis and staying in touch with the team camp-sitting Kaingo camp to make sure the poachers aren’t encroaching on the area and that any reports of gunshots are reported instantly to SLCS and ZAWA. I’m still working on the last orders for the upcoming renovations of our chalets at Kaingo. We’re also in the final stages of recruiting the final members of our 2011 team, with just the chef role left to fill and we’re in discussions with some promising candidates. Please do pass our contact details on though should you know of any qualified chef/caterers who might be interested. On the other side of the planet, Izzy is busy travelling to meet agents and to promote Shenton Safaris globally. She’s been in Paris, London and Amsterdam and is now on her way to the USA for a 6 week trip that will include Boston, New York, Denver, Seattle, Washington, Los Angeles, San Diego and San Francisco! Good luck to you Izzy! I’m so proud to announce that for the third year in a row, Shenton Safaris and particularly Mwamba Bush Camp have been nominated for The 2011 Safari Awards! Although I love being back in my home country of Australia, I always start to feel the blues for the bush around this time of year. 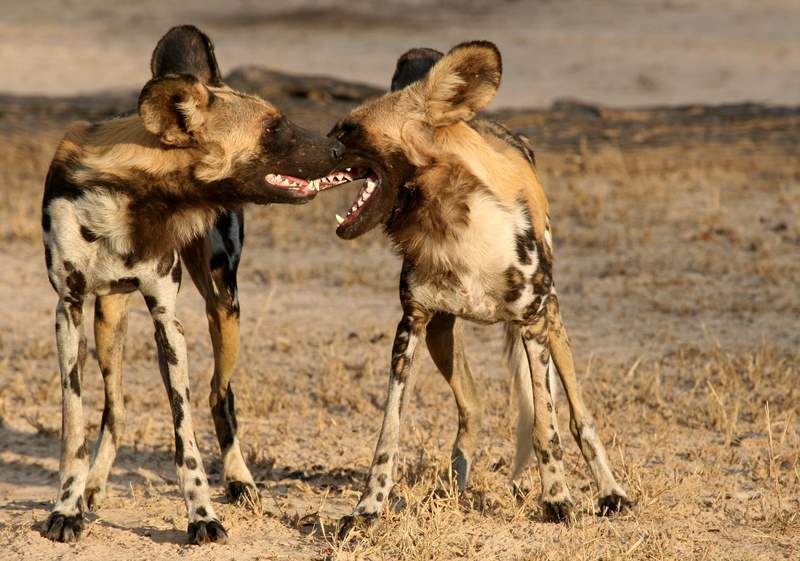 I’ve decided to dedicate this newsletter to one of my favourite, yet elusive, animals: the African Wild Dogs. First a few photos I took of the Kaingo pack a while back, then a summary of the recent report received from the Zambian Carnivore Programme which is monitoring, with the helps of guides and guests, the various predators in South Luangwa. That’s all for me now, and I look forward to our next newsletter with our new baby Shenton. 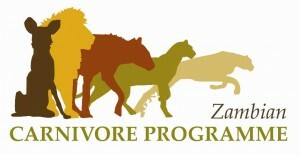 What is the Zambian Carnivore Program? The Zambian Carnivore Programme is a non-profit Zambian registered trust dedicated to the conservation of large carnivore species and their habitats. 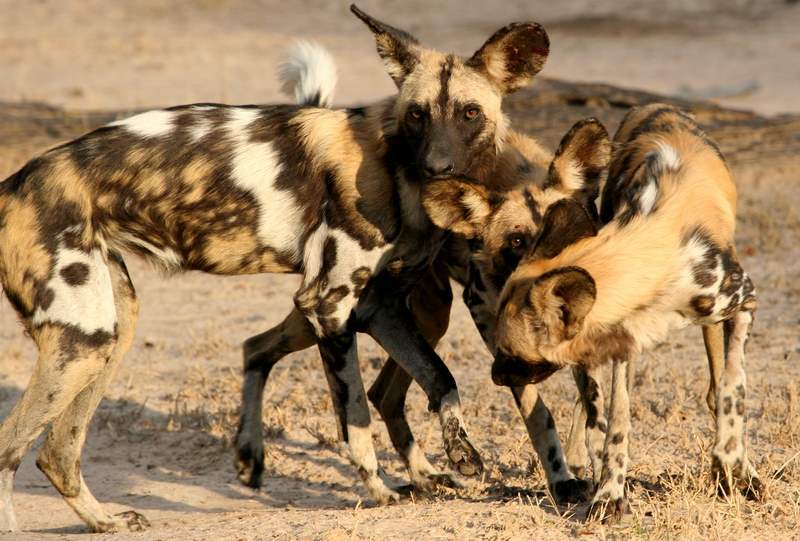 Formerly known as African Wild Dog Conservation, the programme originated in Lower Zambezi in 1999 with a focus on the highly endangered African wild dog. Expanding to the Luangwa valley in 2005 and to the Liuwa, Bangweulu, and Kafue ecosystems in 2010, the programme now focuses on all large carnivore species (African wild dog, cheetah, lion, leopard, hyaena) in the country through a variety of applied research activities, anti-poaching and habitat conservation work, training and employing Zambian nationals in the wildlife conservation field, and supporting and participating in educational work through local schools and communities. 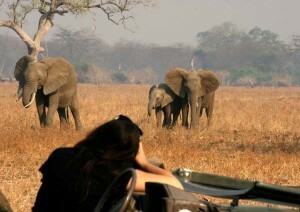 Shenton Safaris and our guests support the ZCP through the Luangwa Conservation and Community Levy. Who is involved? The Luangwa Valley Carnivore Monitoring Program involves the researchers from ZCP along with about 20 guides from 7 lodges in the park, and most importantly it involves safari guests through the pictures they are sending to help identify individual predators. About 700 sightings were reported in 2010 and are still thoroughly studied. How many dogs are there? Resident packs and dispersing groups continue to be intensively monitored via radio-telemetry and photographic monitoring in the Luangwa and since 2007 over 200 wild dogs in 30 packs and dispersing groups have been individually identified which is a significant proportion of the country’s 460 estimated individuals. 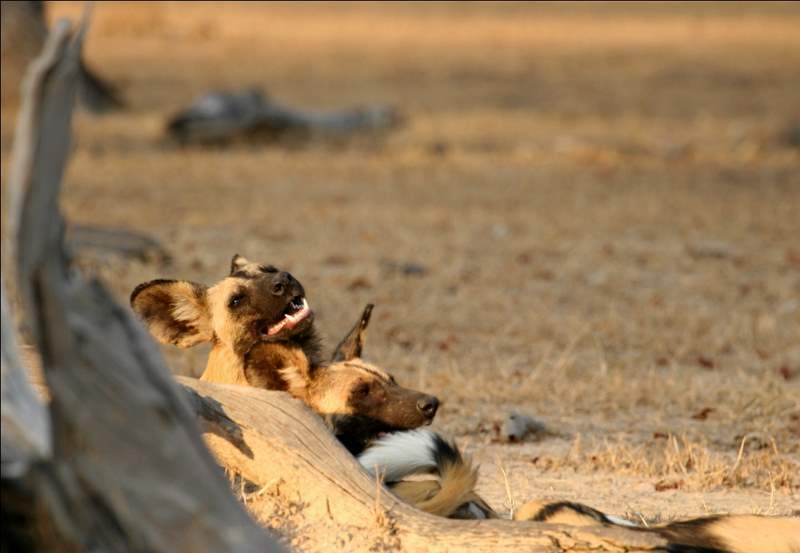 From the 2010 data analysed so far, 110 identified adult dogs are known to be alive in South Luangwa. 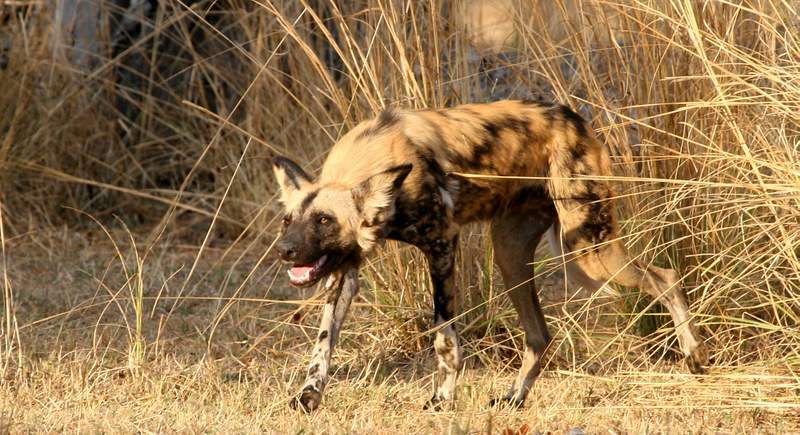 Exchange between dog populations in South Luangwa and North Luangwa national parks and throughout the connecting Game Management Areas (GMA’s) is very important. Dogs can be seen in the Southern part of South Luangwa one month and a couple of months later in the center of North Luangwa. They seem to use the GMA’s quite a lot, due to the difference in prey density, and therefore of lion density. In the intensive study area in SLNP and Lupande GMA we continue to monitor four packs and three dispersal groups. 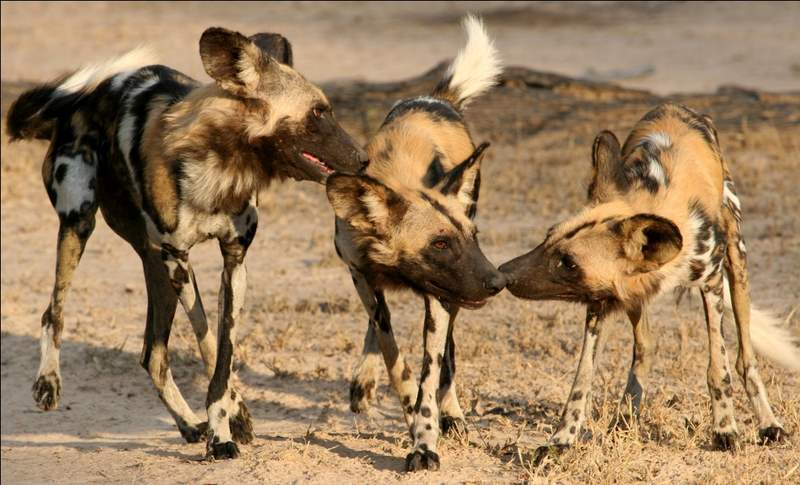 The Kaingo Pack, ranging from Big Baobab north to the Mwamba, decreased from 7 adults to 4 adults in June 2010 following the dispersal of three subordinate females. These females have been sighted recently by Bushcamp Company guides and photographed by their guests between Mfuwe Lodge and the Kapamba river, covering that distance in two days! The remaining 4 adults, 3 males and 1 female, continued denning north of the Luwi river and 3 pups were raised to approximately 5 months of age. We did not document how many pups came out of the den, but given that this is the alpha female’s first litter (and thus is often lower than average) it may not have been very many pups. Unfortunately in their most recent sighting they were down to one pup. Documenting pup deaths is extremely difficult but in many systems up to 30-70% of pups are lost each year, largely due to lion and hyena predation, so this is not necessarily an unusual thing but we will see how this pack will fare this year without a good number of new recruits. The pack in the Chindeni Hills, the Pontoon Pack, has been very difficult to monitor given their locations in the rugged areas of the Lupande GMA, but has undergone some substantial changes. Numbering 5 adults and 7 pups in January, four subordinate males dispersed in the late rains and it is unknown what happened to the pups of that year. The collared female was pregnant and gave birth in late May high up in the Chindeni’s. Unfortunately hundreds of snares were pulled in their area and despite all these efforts the Pontoon Pack was hit hard by snaring. The collared male was sighted in September with a severe snare injury around his paw which would have been fatal had it not been removed by SLCS and ZCP. Snaring seems to be hitting animals extremely hard this year, particularly in the GMA’s and we are uncertain of the fate of the missing dogs. In Nsefu sector a pack of 18 wild dogs (10 adults, 8 pups) has turned up in late September and early October 2010; prior to this the pack was last seen in 2008! These dogs are most visible at the height of the dry season when they are found often near water in the Chichele stream and Kaluzi. Snaring again is hitting this pack hard, with several animals found with snare wire. Collars deployed on this pack in 2010 allow for detection and removal of snares, which in concert with anti-snaring work in collaboration with SLCS will hopefully allow this pack to persist in the area. A very significant number of photographs from guides, tourists, and operators has contributed to both our minimum population estimates and to our understanding of how dogs are moving about the landscape—these photos are invaluable for wild dog conservation so please keep them coming!